The last-known scheme definitely completed in Sorocold's lifetime is the first silk mill in Derby — Cotchett's Mill (1704). The silk industry in England at the time was based on individual handweavers producing cloth for merchants, usually in attic workshops. Italy had a monopoly on the technical advances of the period and the higher quality silk thread wanted by the British market had to be imported. Raw silk originally came from China but was also later produced in Italy, where they developed water-powered machinery that doubled and twisted the thread made from the silk. This twisted fibre is known as organzine, and it is used for the longitudinal (warp) threads in the weaving of silk materials, creating a luxury cloth. The nature of the 'throwing' machinery used to create organzine was a closely guarded secret. Naturally, British merchants wanted to manufacture organzine themselves, avoiding the premiums they had to pay on its importation. Sometime between 1702 and 1704, London-based solicitor Thomas Cotchett (bap.1677 - c.1713) started to build his silk mill in Derby, on the west bank of the River Derwent, very close to Sorocold's operational water pumping engine (Derby Waterworks) at the northern end of the town on the Bye Flatt. Cotchett had obtained a lease on water rights in around 1704 and it is generally assumed that Sorocold designed the waterwheel and associated machinery needed for the mill. On 20th October 1705, Cotchett's father, also called Thomas, who was a barrister in Mickelover just west of Derby, lent his son £2,400. He lent him a further £2,000 on 26th June 1707. These are huge sums of money for the time and it's likely that the loans were made to assist in the continued operation of the mill. The mill had three storeys and measured 17m by 8.5m in plan, and was 10.7m high. The idea was to install eight twisting machines based on a Dutch design, powered by Sorocold's installations, which consisted of an undershot wheel 4.1m in diameter with 24 paddles. The drive was under the floor. Sorocold possibly also designed other drives and gearing. The mill was not a great success and it seems that not all the necessary machinery was installed. Doubters include William Woolley, who commented in his 1712 History of Derbyshire that the mill "only has one engine and needs three". In 1799, Simon Goodrich, a Governement employee making a tour of engineering works, remarked on "the indifference of machinery on which work is performed" and that "Smaller motions of both mills were communicated by wooden wheels with triangular notches cut in them for teeth and everything was a makeshift kind." So the machinery might have been somewhat deficient, although he made these comments almost 100 years after the mill was commissioned. Nonetheless, later owner of the mill William Wilson records in about 1739 in his own handwriting (kept in the Derby Local Studies Library) that "there are eight double Dutch mills, four on each storey, all in complete working order" and goes on to describe in detail the numerous components of the mills, which were operated by a 13ft 6in (4.1m) diameter waterwheel (a separate wheel from the one that later powered the machinery for Lombe's Mill). Whatever the reasons for the technical failure of the mill, Cotchett, although a strong entrepreneur, lacked business knowledge and his business was insolvent after only a few years operation. Cotchett's Mill of 1704 could perhaps be considered the first attempt at a factory system in Britain — bringing materials and workers under one roof, with machinery powered by a common source, all making a single product. This pre-dates Richard Arkwright's (1732-1792) water-powered cotton mill at Cromford by nearly 70 years. The failure of Cotchett's Mill did nothing to quell the continued clamour by wealthier Britains for abundant supplies of silk cloth at rational prices. 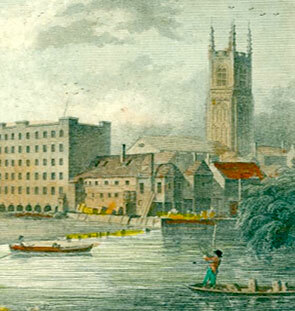 Thanks to the Lombe family of Norwich, this small corner of Derby did in fact become the first successful silk manufactury in the country — indeed the first successful use of the factory system in Britain. Lombe's Mill was in the planning and under construction between 1716 and 1721, and since there are no verified mentions of Sorocold after 1716 (in any capacity), his involvment with Lombe's Mill is uncertain — although he has been credited with the design of its waterwheel. However, there are other connections. 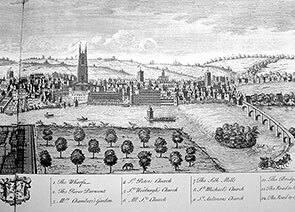 In 1716, John Lombe (c.1693-1722), son of Henry Lombe, wool weaver and merchant of Norwich, travelled to Piedmont, Italy — possibly funded by his half-brother Thomas Lombe, a London merchant and member of the Mercers Company. John Lombe is thought to have once worked for Cotchett, and he set out to steal the secrets of the Italian machinery. Some have suggested that Sorocold may have gone with him — one explanation for Sorocold's 'disappearance' perhaps. Lombe visited his half-brother's Italian silk agent, Glover & Unwin, and somehow succeeded in gaining 'the knowledge' he was seeking. Lombe returned to England in 1717, bringing some Italian workers with him — he was now a wanted man in Italy. In September 1718, Lombe and his half-brother took out a patent for the manufacture of silk. Construction of the five-storey Lombe's Mill began in around 1717, on the south side of the failed Cotchett's Mill which it incorporated. Of the original building, only the foundations and tower are extant, now part of Derby Museum. The work was partly financed by John Lombe's uncle, and partly by running hand-operated small silk looms in various existing buildings round Derby, including Moot Hall. This provided Lombe with experience in the processes as well as finance. Power was supplied by a 7m diameter timber undershot waterwheel, running 12 circular throwing machines on two stories and 26 winding machines on each of the top three floors. A second three-storey building to the south followed shortly afterwards, as the mill's 'doubling shop', with machines powered by hand. Many writers and researchers have named Sorocold as the builder of Lombe's Mill, or as at least providing its power system. They include Daniel Defoe (c.1660-1731), Rhys Jenkins, and more recently Harry Butterton and Anthony Calladine. Certainly, he had the skills but although he was prolific in his work output until about 1712, he more or less disappears after that and no contemporary reports of his direct involvement in the mill have been found. It is possible that the Lombes knew about the Derby site and Cotchett's Mill through contact with Sorocold, who had installed Norwich's water supply and street lighting in 1700. It's also conceivable that the 'security-conscious' Lombes restricted access to their silk project, leaving us no record. The mention by Daniel Defoe can be found in a letter from his first tour of the country, published in 1724/27 — making it the closest thing to a primary source we have so far. He says of Lombe's Mill: "This work was erected by one Soracule, a man expert in making mill-work, especially for raising water to supply towns for family use." Further evidence is needed. However, Sorocold is known to have been in Fontainbleau in France in 1716, where he was trying to make contact with Sir John Erskine, 6th Earl of Mar, for whom he had worked in Alloa in Scotland a few years earlier. 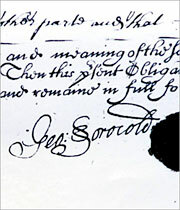 Indeed, it seems Sorocold had many debtors in Scotland who were pursuing him. Some have speculated that he may have fled England after the Jacobite Rebellion of 1715, which is what the Earl of Mar had done. As mentioned in the previous chapter, the Mayor and Burgesses of Derby petitioned Parliament in 1717 to make the River Trent navigable and they included a map made by Sorocold some years earlier. The Mayor referred to Sorocold as "that unfortunate mathematician". Clearly something had gone astray in an otherwise very successful career. The authors of this biography are wondering if he died on the continent, and would very much like to hear from anyone who has further clues (see note on the introduction page). Whether or not Sorocold was heavily involved in the setting up of Lombe's Mill, it was an evident success and helped break the Eurpoean monopoly on the manufacture of organzine. Thomas Lombe went to be invested with a knighthood for unconnected events in London and may well have been made Lord Mayor of London in 1739 had he not died that year. 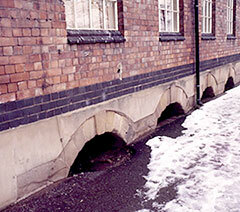 Recent photo of Lombe's Mill in the snow, showing the river arches on the riverbank elevation. These are thought to be by Sorocold. 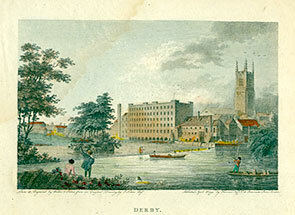 The view across the River Derwent to the silk mills — a section of a 1728 engraving by Samuel & Nathaniel Buck entitled East Prospect of Derby. The mills are in the centre of the image (no tower yet on Lombe's Mill). The church on the left is All Saint's, where Sorocold re-hung the bells. An engraving of the silk mills published 1st April 1794 by Walker & Storer (from a drawing by J. Nixon Esqr. ), with the River Derwent and its weir in the foreground and All Saints Church to the right (where Sorocold rehung the bells, now Derby Cathedral). Cotchett's Mill is the smaller building with a sloping roof, dwarfed by the later Lombe's Mill, the river arches of which can be clearly seen (see photo opposite). A detail of the above engraving, showing Cotchett's Mill (completed c.1704). It is generally assumed that Sorocold designed the waterwheel (not visible) and associated machinery needed for the mill. The big grey roof between the mill and the church is now thought to be the old Gun Powder mill building where the machinery for Derby Waterworks was installed.